The thing about separates is that you can make a little go a long way – layer up, wear as is, play mix-and-match. And if they happen to be in monochromes, it makes them much more utilitarian. They go with just about anything. Here’s a round-up of the pieces we love this minute. German designer Martino Caramia moved to Goa almost seven years ago. His designs are incredibly simple and beautiful. His liveable, breathe-easy cotton kurtas are absolute winners. Delhi-based duo, Amrita Khanna and Gursi Singh, make wearable, minimal clothes. And they’re moved by fashion, yes, but also everything from raw foods to Nordic furniture. The Delhi-based designer is best known for marrying contemporary silhouettes with traditional techniques. 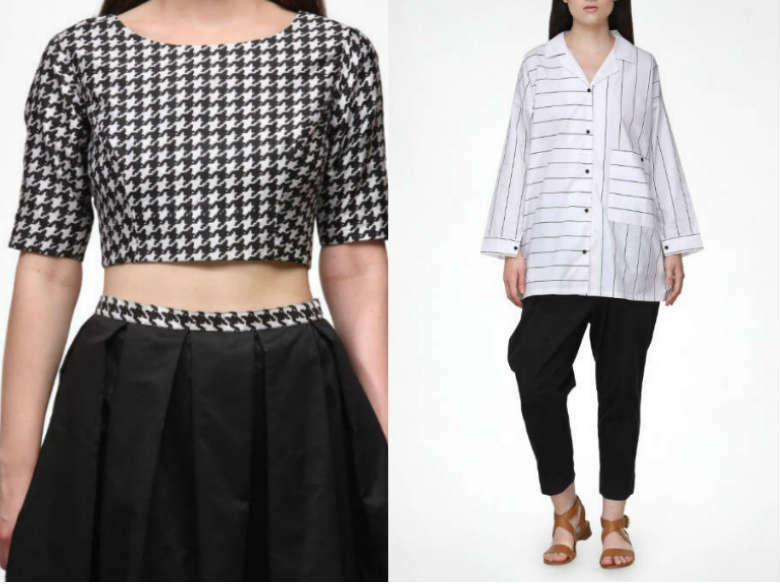 Her monochrome line for Ogaan blends houndstooth and geometrical patterns with neatly structured crop tops and midi skirts. The Delhi based label by Anjana Das focuses on relaxed tailoring. They employ traditional Indian textiles like cotton muslins, silk voiles, chanderi or matka silks. It’s easy to imagine a weekend spent lounging in their easy-to-pair separates.